Bahama Village is so named for its many original residents who were of Bahamian ancestry. 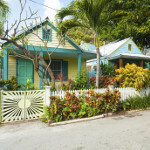 Today it is home to many original residents ancestors as well as some of the best restaurants and shopping in Key West. It is definitely an area that is up and coming for real estate as many of the original Conch cottage style homes are being renovated, keeping with the historic charm of the neighborhood and Old Town Key West. Every October, Bahama Village is home to Goombay Festival, a weekend-long street festival full of food, crafts, music and all things Bahama Village. It’s also the kick-off party for Key West’s Fantasy Fest, an annual week-long party, similar to Mardi Gras.